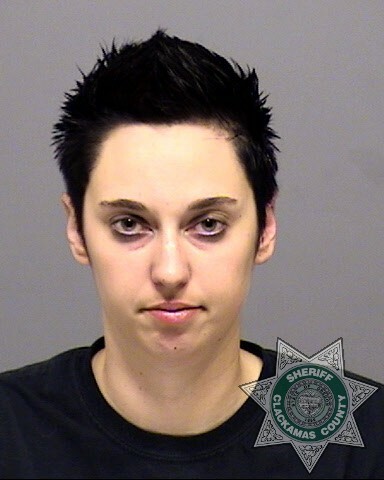 LAKE OSWEGO – On Friday, October 17, 2014, officers arrested 29 year old Tigard resident, Brenda Erin Adams, following their investigation into an early morning fire at a demolished house in Lake Oswego. At 3:19 a.m., Lake Oswego Communications (LOCOM) received a 911 call from the emergency phone outside of the Westlake Fire Station reporting a fire on Fosberg Road. Crews responded and found a fire in a large debris pile at the site of a demolished house. Before it could be extinguished, the fire caused $10,000 in damage to a construction excavator at the site. While dealing with this incident, fire crews were flagged down by a passerby about a hedge fire nearby. That fire was extinguished and, while police officers were standing nearby, they noticed a vehicle drive by the scene that was driven by a female who was known to them because of numerous previous contacts. They attempted to stop her to determine why she was there, but they were unable to locate her. One officer at the scene knew that the driver, 29 year old Brenda Adams, worked nearby, so he went to her workplace at about the time he thought she would start her work day and found her in her vehicle in the parking lot. Ms. Adams admitted to setting the two fires, and also to spray painting the word “SUICIDE” in at least five locations around Lake Oswego. Evidence was recovered from her vehicle and she was later arrested and lodged at the Clackamas County Jail for Arson 2, Reckless Burning and two counts of Criminal Mischief 1. Ms. Adams photo can be found on our Twitter feed or our website.